I&P Group Sdn Bhd, a wholly-owned subsidiary of Permodalan Nasional Bhd (PNB), aims to repeat the RM1.4 billion revenue it chalked up last year, despite the more challenging time this year. Its managing director Datuk Jamaludin Osman said properties with gross development value of about RM3 billion were expected to be put into the market this year. “Every year, we have new phases. New phases will be offered to the market through various township developments,” he told Business Times in an interview in conjunction with this year’s Minggu Saham Amanah Malaysia (MSAM) exhibition in Kota Kinabalu. I&P has successfully developed several major and well-known projects, such as Bukit Damansara, Bandar Kinrara, Alam Damai, Alam Impian, Alam Sari, Temasya-Glenmarie, Bandar Baru Seri Petaling, Taman Pelangi and Taman Perling. It is learnt that the group has 3,622ha of land in the Klang Valley and Johor Baru, with 1,195ha still undeveloped. Jamaludin said the timing of the company’s property launches would depend on the market condition and the approval status. Despite the uncertainties in the global economy, Jamaludin said he expected the industry to grow in tandem with the anticipated growth of the country’s economy. On the MSAM, Jamaludin said I&P had been participating in the exhibition since its inception in 2000 as it was a good opportunity for the group to showcase it projects. The MSAM, organised by PNB, will be held from April 20 to April 28. “By participating in MSAM, people can see that PNB is not just a unit trust conglomerate but has reliable subsidiaries such as I&P. 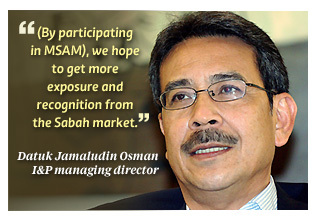 “We hope to get more exposure and recognition from the Sabah market. We want the public to know that one of the businesses run by PNB is property development through its subsidiaries like I&P,” he said. He said while I&P had yet to make its mark in Sabah, its participation in MSAM would enable the people there to know more and invest in the company’s development projects in the Klang Valley and Johor. I&P Group was formed in May 2009 after the successful merger and rationalisation exercise between three companies under PNB, namely Island & Peninsular Sdn Bhd, Petaling Garden Sdn Bhd and Pelangi Sdn Bhd.